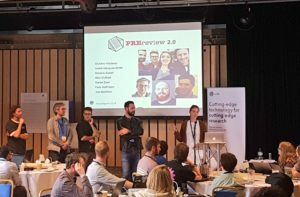 I’d like to take the opportunity to reiterate our thanks to you and the whole team at Heron IT who helped make the eLife Sprint possible. As you are aware, WiFi and internet connectivity are necessary for enjoyable hackathons, and are so frequently the bit that goes awry. Thank you for being so flexible in order to meet our needs in J3. Having you around at the event really helped calm the nerves and made a big difference. I hope you enjoyed being around the great vibe too! Alessandra Dillenburg, PhD Student, University of Edinburgh. Ian Mulvany, Head of Product Innovation at SAGE Publishing. Read the eLife summary of the event. Explore a round-up of the eLife Sprint projects on eLife Labs.